This month’s KingFut’s Pharaoh of the Month award, which recognizes the best Egyptian athlete of March 2019, goes to Kasimpasa forward Mahmoud Trezeguet. 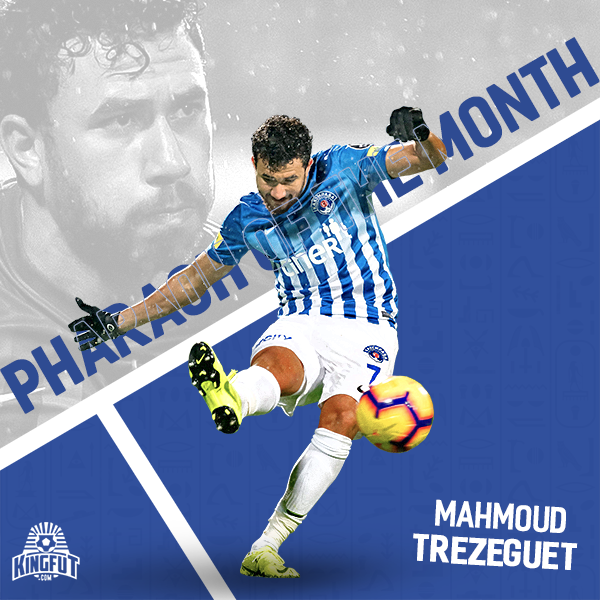 The KingFut Pharaoh of the Month for March 2019 is Kasimpasa’s Mahmoud Trezeguet. The Egyptian International bagged two goals and assisted once in three games for the Apaches in March. Trezeguet claimed the Man of the Match award in Kasimpasa‘s win against Akhisarspor. Ahmed Hassan Kouka: Kingfut’s February 2019 Pharaoh of the month. With his blistering speed and precise crosses, Trezeguet has proven his worth to the Apaches. The former Anderlecht winger displayed notable performances in the Turkish Super Lig matches against Trabzonspor, Goztepe, and Akhisarspor. In the 24th round of the Turkish Super Lig, Trezeguet scored a penalty to help his team comeback from a 0-2 deficit and end the game 2-2 against Trabzonspor. The Egyptian managed to score his eighth goal of the season and provide an assist against Akhisarspor. In the 87 minute, Trezeguet played a simple pass to Abdul Khalili, who fired a rocket into the back of Akhisarspor’s net, and seven minutes later, the Egyptian scored the winner from the edge of the penalty area after a fantastic solo run by Karim Hafez. READ: Trezeguet scores, assists as Kasimpasa defeat Akhisarspor. Kasimpasa currently sit 10th in the Turkish Super Lig table with 34 points, and their next game will be against 17th-place Erzurum BB on April 7. Trezeguet has now scored eight goals and assisted seven in 26 league games. Earlier this month, Egypt international Mahmoud Trezeguet confirmed that he will leave Kasimpasa next summer, saying he nearly joined a big Turkish club. Trezeguet has been at Kasimpasa since July 2017, joining the club on loan from Anderlecht, before they made the move permanent last summer. Since then, Trezeguet has scored 22 goals while assisting 15 in 60 games across all competitions, which resulted in several European clubs gaining interest in signing the former Al Ahly player. Germany’s VfB Stuttgart, Italian sides Lazio and Napoli, Beşiktaşand Galatasaray of Turkey, as well as Czech club Sparta Prague have all expressed their interest in signing him. However, Kasimpasa turned down all the offers and according to Trezeguet, they promised him to let him go in the upcoming transfer window. Trezeguet’s performances earned him a spot in Egypt’s national team, for the games against Niger and Nigeria. It was time for him to shine with the Pharaohs who have been suffering from a deficiency of strikers, since many players such as Ahmed Hassan Kouka and Marwan Mohsen have not proved superiority up top. The Egyptians were usually criticized for their excessive defensive style and tactics attributed to former head coach, Hector Cuper, who mainly relied on Liverpool’s Mohamed Salah for scoring goals. With the appointment of new head coach, Javier Aguirre, the transition to an offensive style began to appear as the team scored 15 goals in four games under under the new Mexican coach. In their friendly matchup against Nigeria, the Super Eagles handed Egypt their first defeat under the Mexican manager, thanks to a strike from Paul Onuachu, who scored the only goal of the game after only seven seconds. Do you think Trezeguet’s deserves to be Kingfut’s Pharaoh of the Month?